I recently had a conversation with a new Twitter friend and author J.A. Saare about book covers. She posted a link to her blog where she discussed designing the cover for her book Dead, Undead, or Somewhere in Between (which looks really good and I have to read it–going in the TBR pile). I thought it was just cool and awesome that she designed the cover herself and I now wish I had PhotoShop and the immediate ability to use it. I use PowerPoint. Why? Because I’m really good with PowerPoint. Let me show you. I shared a mock up book cover with her as well for my novel Nemesis, a romance I’m about to query as soon as I finish the edits. It’s not my favorite cover, but that picture on the front is totally my main character (MC) and if I can’t use the original, I have another idea and a few friends who are better photographers than me. I enjoy designing book covers for the novels I’m writing. Sometimes, I design them for inspiration to finish the book. So I thought I’d share some with you. The first cover, I didn’t exactly design. I told my cousin Lori, who DOES know the ins and outs of PhotoShop, exactly what I wanted and this is what she designed before my eyes in about ten minutes … disgusting. 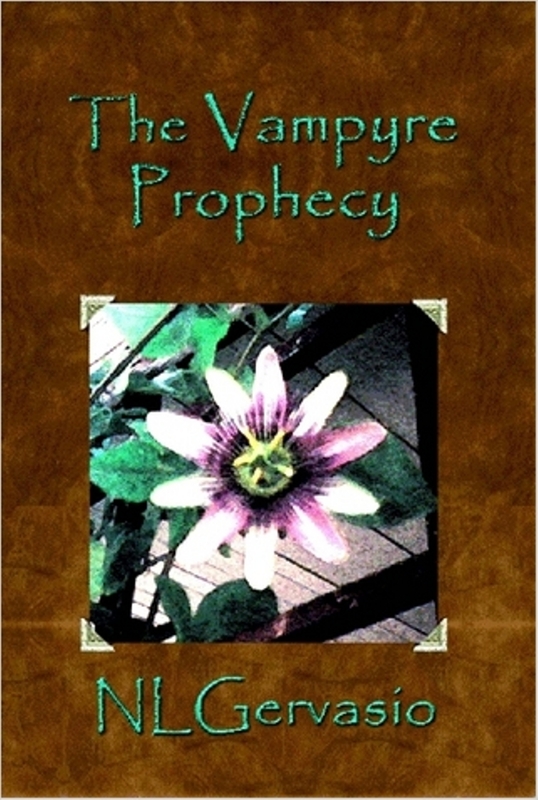 This is the cover for my first and desperately-needs-to-be-rewritten novel The Vampyre Prophecy. No, really. I can’t even read it without getting out the purple pen (I never use red … too traumatic and causes grade school flashbacks). This is the book where, when I see it, I kick myself for not finding a critique partner like Sharon Gerlach or H.C. Palmquist, who will both slap me upside the head for the crap that is in this novel. You can’t even find it on my website now and I’m about to delete it. Having a little trouble with that because it is, after all, my firstborn. I know, I know. I really need to just let it go. I’ve found one tiny flaw on this cover, so being that I’m ADD and OCD, I see it every time I look at it and it drives me insane. Thanks Lori. The next cover is one I designed myself. 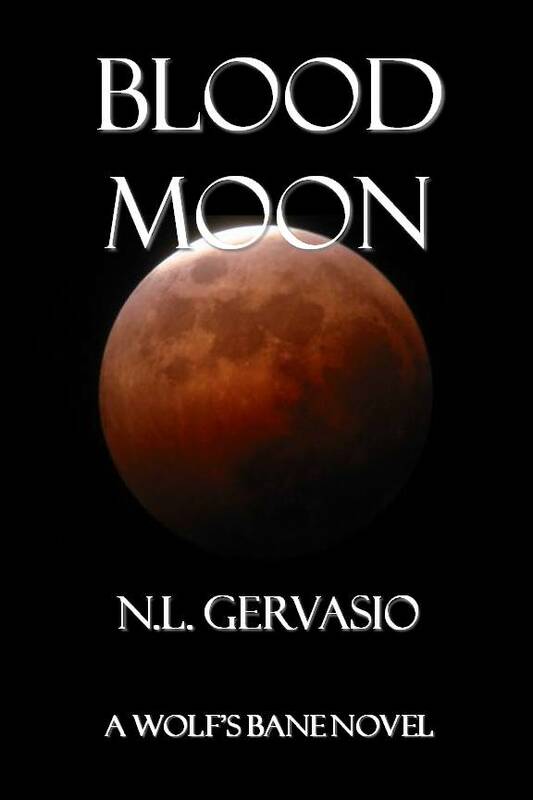 This is the second book in the Prophecy series, and yes, it also needs editing, but not as much as the first one. I’m kind of a font whore and like to experiment with new ones here and there, and especially on books. How I made this cover was very simple and required only a quick image search, downloading the font, a piece of parchment paper, and a camera. Obviously, a computer is involved too, but I don’t think I need to tell you that. Or do I? The font used is called Gothic Hijinx Rough. If you know my alter ego online name, you’ll get a kick out of that. The washed out images are runes and such, and I wish I could remember where I found them. 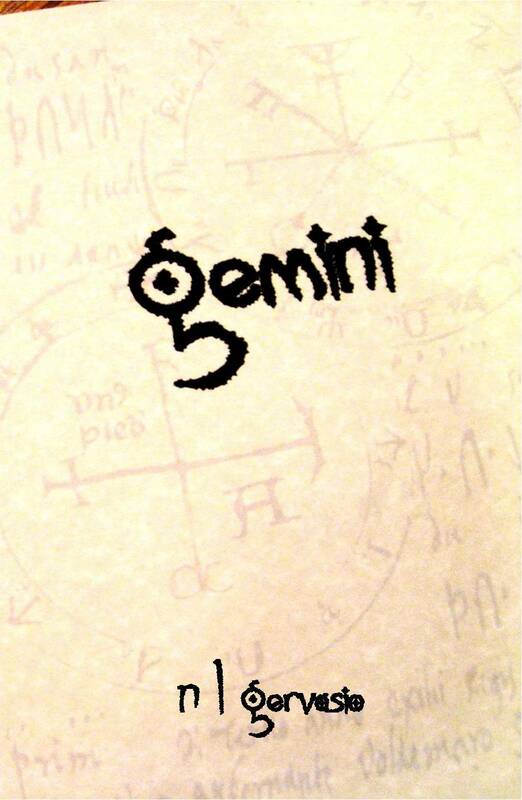 I printed the title Gemini and the washed out rune images onto the parchment, and then placed it on my oak dining table at an angle and took a picture. Once I had the picture uploaded, and after messing with brightness/contrast, I inserted it in a PowerPoint presentation and added my name, using the GHR font. Then I saved it as a JPEG. See? Simple. 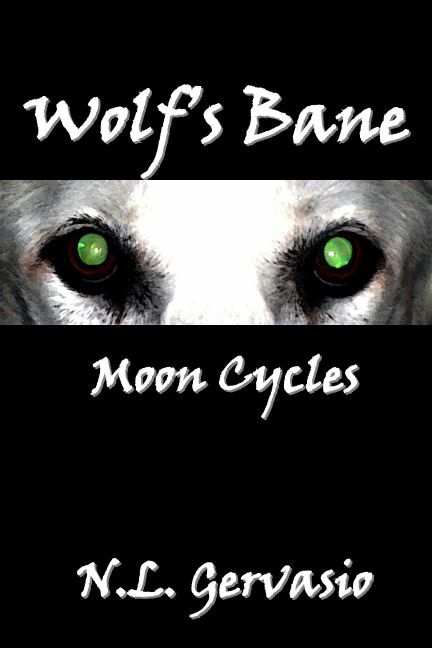 The next cover is the original mock up of my werewolf book Wolf’s Bane: Moon Cycles. I’ve changed the title since then because I’m rewriting the entire book and a half. Yes, that’s how far I got before throwing nearly all of it in the chophouse file. Every book I write has a chophouse file. The photo credit on those eyes belongs to me. The eyes belong to my MacLeod, who passed away in June 2006. I miss my Great White Beast. He was a beautiful all white German shepherd/Malamute mix. Also done in PowerPoint with only a black background, three text boxes and the picture. Not too shabby, except now I hate that font. I like the Blood Moon font and picture much better. See how that stands out? Unfortunately, I’m not certain I can use that picture because I don’t have the copyright information on it. This is a very important step if you don’t own the photo. It’s really not a problem, though, because I can either do a reverse search on the photo to find the information using TinEye, or I can find a similar photo of a red eclipsed moon that I can use. I never did a mock up for Dusk of Death or Tir na nOg, which surprises me a little. I’ll have to remedy that. This is the mock up cover for Nemesis that I mentioned at the beginning of this post. I think that’s my favorite picture of all time, though I’m certain it will offend a few. That’s fine. Nemy’s good at offending people, so it makes it true to the MC. And finally, tonight I just did five mock ups on my current work-in-progress (WIP) just to see what I could come up with, and I’m quite please with the result. So much so that I’m not certain which cover I like best. The first one, I really like because of the picture. She kind of fits my MC. Almost perfect, but not quite. Last night (or early morning, since I’m nocturnal), I wrote about 3400 words on Gods of War, staying awake until around 9AM. I couldn’t stop until I finished a very steamy scene. Tonight, I haven’t written a thing, so I’m going to go work on that now. Let me know which of the Gods of War mock ups you like best, or if you don’t like any. And never underestimate the power of programs that aren’t originally designed for creating things like this. Sharon Gerlach has designed two of our Forever Nocturne issues entirely in MS Word. GoW3 I like it the best. And the Blood Moon, it’s sharp! It’s fine to do so. Make sure you get the permission from the artists also. Or ask a new artist looking to get exposure. They’re out there. Good to see you inspired once again. 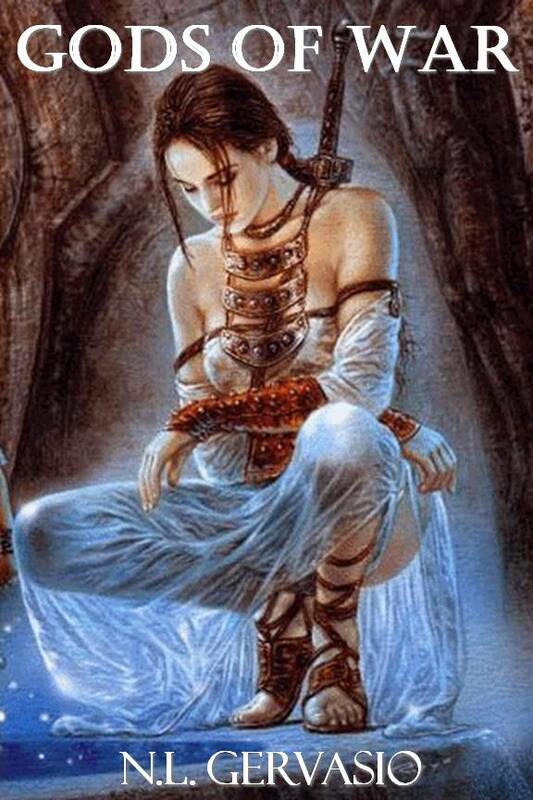 Wow, beautiful work!! I am horrible with Powerpoint but it looks like I should start messing around with the program. 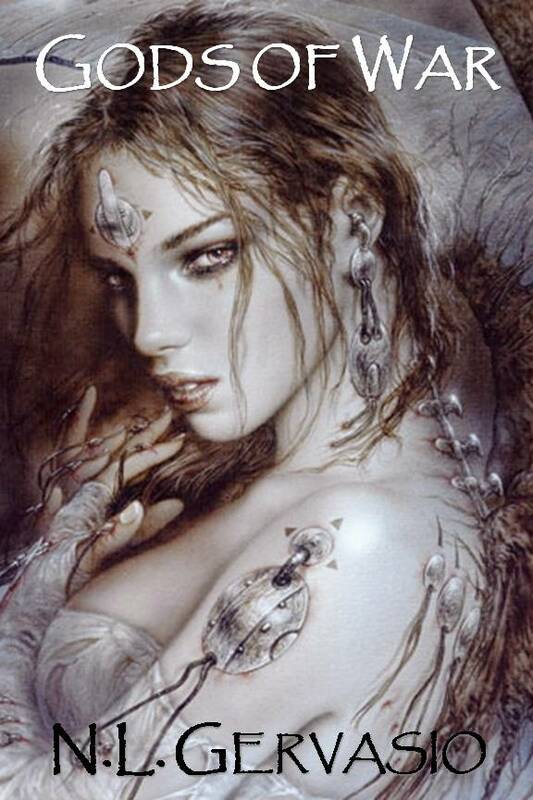 I love the cover of Nemesis — tattoos and skin don’t bother me all that much. If there is one setback to making book covers, it’s the purchasing the images for use. There were a couple I wanted but I had to pass (paying $20 per photo is about as high as I can go) but overall I was glad with the finished cover of Dead. Carrie – Thank you. I would definitely get permission and have had to do so for FN images. However, it’s part of the reason I like to take my own pictures. =) BTW, the one I used for your story Forked is on Flickr now. Jaime – Thank you. I really like the cover you did for Dead. It turned out well and when I pick a book to read, cover usually has something to do with my decision. And yeah, I’m not sure I’d pay more the $20 for a photo either. I’m a Powerpoint fan too, but would love to learn to use Photoshop as well. I think the Nemesis cover is hot. I would however like it better if the words were a little distorted to bend and stretch across the breasts a little bit. I love #1 and #5 of Gods of War. If you don’t use #1 this time, I hope to see it on something else. Love it! Kelley – Yes, I thought the same about the Nemesis cover. Definitely need to fix the shape of the word. I think GoW #1 is slowly becoming my favorite. I’d just like the art altered a bit to fit my character better. Hey, I’m bunny-pig on Heather’s blog too. Am I bunny-pig everywhere?